Ivy in Bloom captures the weariness of a young girl tired of a long winter. "I stare out the window," she says on the first spread of brown and gray, "looking for birds or flowers / or even warm showers / but I don't see any such thing." But then Spring comes when "March is out of breath snow melting to flowery waters and watery flowers spring rose from its wintry rest." And Ivy's "heart dances with daffodils." As these words also dance across each spread, Ivy's world erupts into a riot of color. Vanita Oelschlager is a wife, mother,grandmother, former teacher, current caregiver and, for almost ten years, author and poet. 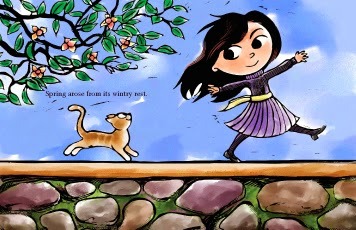 This is a lovely children's picture book merging classic poetry and creating a story about Spring. 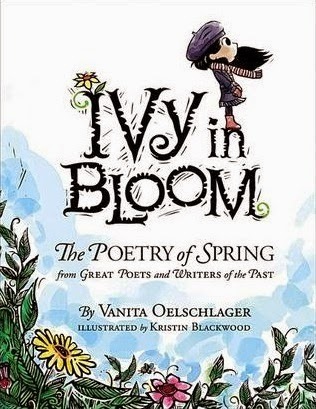 It begins with Vanita Oelschalger's own poem about awaiting Spring's return after a cold and windy winter. The book reads rhythmically, and highlights some of the loveliest lines of poetry that follow this theme. Poetry picture books are always a commodity to have for storytimes because they expose kids to rhythm, music, and beats. 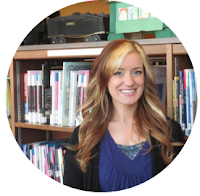 It opens avenues for them to learn how to communicate in effective and diverse ways. This being said, I like the idea of this book. It has a lot of potential, and the illustrations are sure to catch the eye. On Oelschalger's website you can find activities for kids to coincide with the book, including coloring pages, greeting cards, bookmarks, and more! You can check them out HERE. The images are gorgeous. 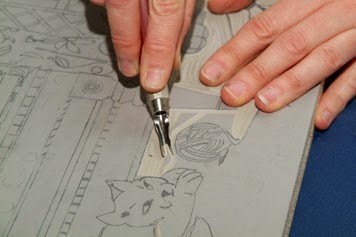 Illustrator Kristin Blackwood creates outlines to sketch on a linoleum block printed in black on white stock. She then takes the images and makes them digital by scanning them with a flatbed scanner. The watercolor effect is created by digital editing software, the result being these lovely images capturing the reminiscent nature of the poetry. This is a book that adults can enjoy for their kids, but it might go over young heads. Also, it would be nice if the respective authors were cited underneath words (or at least somewhere on the page). It is a great idea to create a collection of classic poetry in the form of a light-hearted story, but at times it didn't seem to flow together, and I'm afraid that it might confuse kids a little bit. I definitely support exposing them this way, but I think it probably needed to be done a little more fluently. Lovely illustrations, great poems, but needs a little more work. 3 stars.